Signed by Neil Warnock to boost his side's promotion push in March 1996, Corazzin was an exciting signing by Argyle standards. A Canadian international, the 24-year-old striker had scored 43 goals in two-and-a-half seasons at Cambridge United and cost the Pilgrims £150,000. What raised eyebrows around Home Park was that Argyle already had an established front pairing in Adrian Littlejohn and Mickey Evans - so Corazzin's signing was seen as a rare but welcome luxury. Indeed, the former Winnipeg Fury and Vancouver 86ers hitman had to be content with a handful of substitute appearances as Argyle won promotion through the playoffs - though he did at least open his account for the club before season's end, scoring a penalty with practically his first touch as a substitute in a 1-0 win against Mansfield. 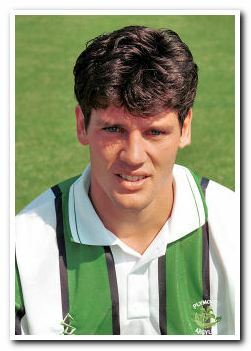 Corazzin was in and out of the side as Argyle consolidated in 1996/97 following promotion into the third tier, and only established himself in the side when Evans was sold to Southampton in late February. Three goals up until the end of the season - to add to the three he had already chalked up before Evans' departure - offered a modest but respectable return from what had been a stop-start season for the Canadian. The following season, however, saw Corazzin finally hit his stride in Devon. Given an extended run in the side by new boss Mick Jones, the stocky North American with boyish good looks took until 18 October to open his 97/98 account, but that strike in a 3-2 defeat to Southend proved to be something of a catalyst. By the end of the season, Corazzin had 17 goals to his name - all in the league - including a devastating six-goal burst in nine mid-winter games. Sadly, Corazzin's team-mates were not quite as effective, and Argyle were relegated back into the basement division after winning just six of the 16 games in which Corazzin found the net. As the club's most saleable asset, the Canadian's exit was inevitable and he duly signed for Northampton Town in June 1998. Two seasons at Sixfields were followed by three years at Oldham Athletic, after which he returned to his homeland to see out his career with Vancouver Whitecaps.